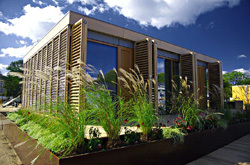 (In the photo is Solar Decathlon Universität Darmstadt) Modern society shows a development trend and an increasing consumption. This makes the cost of living to change. The equivalent price of a pleasant life is the energy consumed per capita. It is a statistical parameter showing quality of life through the consumed energy that a country uses for its assessment during the year. Therefore, a direct connection to the average amount of energy consumed and the quality of life in a country (community). Most developed societies consume the most energy, while the least poor. And very important is that consumption is increasing year by year. Some strategists say that until the 2040th energy consumption will increase by 300%. This data may alert us as we are on the threshold, or have already entered the so-called “peak oil” – the maximum of production of oil. On the other hand, confidence in nuclear power is declining. Therefore, it is being spoken the energy crisis is approaching! Until we develop a reliable process for nuclear electricity generation, the solution is seen in alternative fuel sources – development of the renewable energy. There are certainly a leading sources of solar energy, wind energy, hydro energy, biofuels, waste treatment, geothermal energy, etc.. For that reason many efforts have been made in developing plants that will produce electricity from the listed energy sources. On this occasion, we turn to solar power (or solar radiation that reaches the earth’s surface). “Catching the light” is a challenge to modern human society from ancient times until now (the long history of solar cells). To gain solar energy available to everyone and easily operated, maybe sounded as utopia a century ago, today you should only buy a solar panels and instal them at home (for example on the roof). These days, solar power is reaching its development. PV modules as one of the solutions offered to everyone as a very good contribution to solving problems. Although, there are various technologies, all PV modules can be applied in either an autonomous “off-grid PV systems” or the “grid-tie PV systems” (related to the local distribution network). Thus, society becomes aware of these natural advantages. Today there are various forms of that applications where solar energy is exploited, some more and some less effective. New ideas never end, but the basics stay the same. The attached video gives a brief overview of these opportunities, both for the solar panels and the solar collectors (they are used to heat water or other liquids). Shown solutions are easily affordable, in prices of PV modules and their warranty. This may give additional impetus to enthusiasts and researchers to continue their work, as well as all the others for whom solar energy have become inevitable. Commercial products have been around a lot so that the limits of participation of solar panels constantly move. Energy is what we need and the Sun daily sends it in huge quantity.